In this video from GTC 2014, Steve Oberlin from Nvidia describes his new role as Chief Technical Officer for Accelerated Computing. Along the way, he discusses: the HPC lessons learned from the CRAY T3E and other systems, Nvidia’s plans to tackle the challenges of the HPC Memory Wall, the current status on Project Denver, and how Nvidia plans to couple to the POWER architecture in future systems. 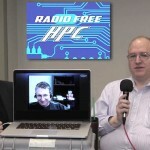 In this video, Dan Olds and Rich Brueckner from Radio Free HPC take a Tesla Motors electric sedan for a test drive. Dan has a lead foot, so hang on and come along for the ride!